Carroll’s Conner Osterholt (8) is the leading scorer in the Greater Catholic League Co-Ed. He and his Patriots teammates are undefeated, yet they received a No. 3 seeding in the Division I sectional tournament pairings, which were released earlier this week. 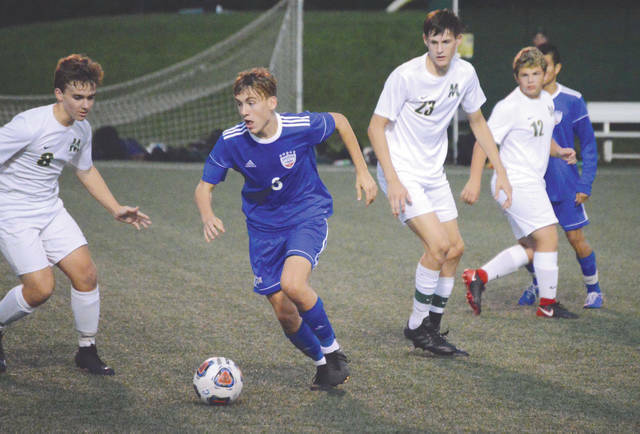 GREENE COUNTY — A trio of Greene County area high school boys soccer teams earned top-3 seeds in their respective Divisions, and five area teams were seeded among the area’s top-7, for the upcoming 2018 postseason sectional soccer tournament. Defending Division I state champion Beavercreek earned the No. 1 seeding in its bracket, while Carroll (D-I) and Bellbrook (D-II) both came in at No. 3 in their respective brackets. Yellow Springs is a No. 5 choice in Division III and Greeneview comes in at No. 7. Here’s a look at each of the postseason tournament brackets involving teams from the Greene County area. Teams are listed by seed number and school name. The higher seed (lower number) hosts first- and second-round matches. A full listing of all of the tournament brackets can be found on the Ohio High School Athletic Association’s Southwest District website at swdab.org . No. 3 Carroll vs. No. 16 Belmont, 7 p.m.
No. 8 Northmont vs. No. 15 Xenia, 7 p.m.
Carroll-Belmont winner vs. No. 17 Springfield, 7 p.m.
Northmont-Xenia winner vs. No. 6 Butler, 7 p.m.
Sectional Final, 7 p.m., Centerville HS. Winner vs. Cincinnati 2 Bracket winner, 7 p.m., Oct. 25, site TBA. No. 10 Fairborn vs. No. 11 Sidney, 7 p.m.
No. 7 Miamisburg vs. No. 12 Tecumseh, 7 p.m.
No. 4 Troy vs. No. 13 Stebbins, 7 p.m.
No. 1 Beavercreek vs. Fairborn-Sidney winner, 7 p.m.
Miamisburg-Tecumseh winner vs. Troy-Stebbins winner, 7 p.m.
Sectional Final, 7 p.m., Doug Adams Stadium, Xenia. Winner vs. Cincinnati 4 Bracket winner, 7 p.m., Oct. 25, site TBA. No. 1 Alter vs. No. 13 Trotwood-Madison, 7 p.m.
No. 4 Eaton vs. No. 7 Valley View, 7 p.m.
No. 3 Bellbrook vs. No. 10 Greenville, 7 p.m.
No. 12 Ponitz vs. Alter-Trotwood-Madison winner, 7 p.m.
Eaton-Valley View winner vs. Bellbrook-Greenville winner, 7 p.m.
Sectional Final, 7 p.m., Fairmont HS, Kettering. Winner vs. TBD, 7 p.m., Oct. 25, Site TBA. No. 9 Miami East vs. No. 25 Stivers, 7 p.m.
No. 10 Bethel vs. No. 22 Carlisle, 7 p.m.
No. 6 Botkins vs. Miami East-Stivers winner, 5 p.m.
No. 7 Greeneview vs. Bethel-Carlisle winner, 7 p.m.
Sectional Final, 7 p.m., TBD. Winner vs. Dayton 5 Bracket winner, 7 p.m., Oct. 25, site TBA. No. 16 Madison vs. No. 18 Lehman, 7 p.m.
No. 5 Yellow Springs vs. No. 26 Southeastern, 7 p.m.
No. 3 West Liberty-Salem vs. Madison-Lehman winner, 7 p.m.
No. 23 Franklin-Monroe vs. Yellow Springs-Southeastern winner, 7 p.m. Winner vs. Cincinnati 3 Bracket winner, 7 p.m. Oct. 25, site TBA. The area’s girls high school volleyball sectional tournament draw is scheduled to be listed in Thursday’s Greene County News papers.